The political leanings of the UK's national newspaper titles appear to be sharply at odds with those of the general public. 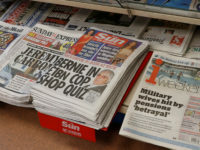 Press Gazette analysis of UK national newspaper leader columns and editorial coverage suggests that 60 per cent of the UK's national newspaper market leans towards the Conservatives – versus around 33 per cent of prospective voters. In the first week of general election campaigning, the Daily Mail, Sun and Daily Telegraph in particular have run largely negative stories about Labour and leader Ed Miliband, whilst mainly backing the Conservatives. On 1 April, The Daily Telegraph ran a front page story revealing that 100 business leaders had written an open letter saying that a Labour government would "threaten jobs and deter investment". 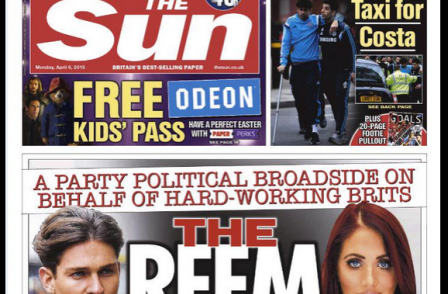 Sun leader columns have been broadly critical of Labour and supportive of the Conservatives. The paper's editorial coverage has included revealing Miliband's "oddball motivational notes" left in a dressing room before the party leaders' debate. Yesterday, The Sun condemned Labour's plans to end the "non-dom" tax loophole saying: "Only one thing is clear from Ed Miliband's unholy muddle on non-doms yesterday: he doesn't give a damn if it works for Britain as long as it sounds good for Labour." The Daily Mail has also made its views clear, describing Miliband as "Red Ed" in its leader column and warning today that "a weak Prime Minister Miliband – in hock to the even more Left-wing SNP, and struggling to command the support of his party on Trident – would be a grave threat to national security". But despite the strong criticism of Labour in most of the national newspaper market (by circulation) the latest polls suggest the party has pulled ahead of the Conservatives in the first week of campaigning. 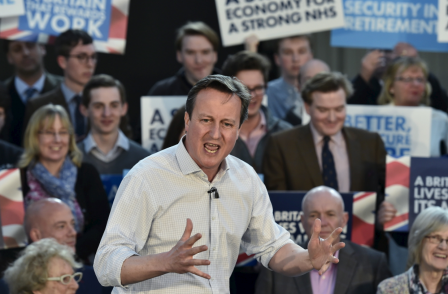 The May 2015 website’s poll of polls now has Labour at 35 per cent, with the Conservatives at 33 per cent. A week ago most polls showed the two parties neck and neck. The following table divides up total UK-wide daily newspaper circulation (plus Evening Standard and Metro) by apparent political leaning. 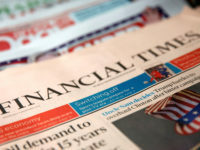 Press Gazette looked at the 12 UK-wide national newspapers audited by ABC – The Daily Telegraph, The Times, the Financial Times, The Guardian, The Independent, the i, Daily Mail, Daily Express, The Sun, Daily Mirror, the Daily Star and Metro – as well as the Evening Standard. The figure for support of the Conservatives comes from five newspapers – The Daily Telegraph, Daily Mail, The Sun, Times and the Evening Standard – which together have a circulation of 5,257,940. The Times leader columns have been broadly supportive of the Conservatives over economic issues. A leader on 7 April said that "Ed Balls and Ed Miliband, meanwhile, give the impression that a few extra taxes on millionaires will be enough to reduce the deficit". Another on 2 April said: "Labour has reverted to type as a party that is full of ideas on how to spend the money it has no real notion of how to raise." And after the debate, an editorial was dismissive of fringe parties, and Nick Clegg. It said Nick Clegg attempted to distance himself from David Cameron "without credibility". The Evening Standard appears to have been broadly supportive of Conservative Mayor of London Boris Johnson – a recent editorial lavished praise on his “moral case for capitalism”, whilst also being critical of Labour’s economic policy. And in the recent controversy over non-domiciled tax status, the paper has also been sceptical of Labour’s proposals to scrap it. "Simply attacking non-doms in order to signal to the electorate that Labour is against privilege is not a helpful way to plan a tax regime," the paper said. In a 7 April editorial, the Standard said that Tony Blair's speech on Europe was "precisely the broad perspective that is welcome from a former premier who has become a global statesman". At the same time, the paper preferred David Cameron's position on an EU referendum. The newspaper called it "a coherent position, and one that may secure some concessions from like-minded states". In a concurrent editorial, the Evening Standard called Labour's mansion tax policy "ill thought-through". The i, with its circulation of over 275,000, has already said it will remain neutral. Metro and the Daily Star both remained neutral in the last election, and no particular bias is discernible in their editorials. Daily Star columnists do not often write about politics, and one recent example took the “they’re all as bad as each other” approach. The Independent appears to be party-politically neutral, although it has been sympathetic to the Greens – calling for the party's inclusion in the television debates and satirising its exclusion. The paper’s editorial on Natalie Bennett’s “excruciating” interview, in which she couldn’t remember how to pay for her housing policy, was also broadly sympathetic. The Independent has also published editorials praising the Liberal Democrats. The FT has been critical of some aspects of Labour economic policy but is also pro-Europe, so its party political allegiance remains unclear. The Daily Mirror is the only unequivocally pro-Labour UK national newspaper. 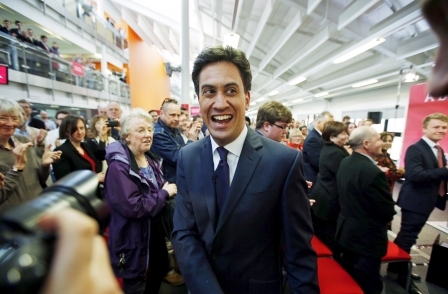 The Guardian has praised Ed Miliband for having “the temerity to attack media phone-hacking abuses”. The paper has also been approving of the Liberal Democrats, especially after the party's 2014 conference. It said that "there is no party in British politics that can match them for discipline under fire" and that "Britain will still need a Liberal Democrat roar". And it ran an editorial as parliament dissolved defending the concept of coalition governing. On 29 March the paper said that the current coalition government had "shown that two parties working together can deliver strong government". Anti-Labour and anti-immigrant sentiments are common in Daily Express editorials. This one, from 7 April, claims that Labour do not trust people with their own money, and is published alongside another editorial that warns of “worryingly large number of dangerous, hardline Muslims who refuse to integrate”. Another editorial, on health tourism, chimes with UKIP policy. In it, the paper says that the mainstream political class "have all had a hand in Britain’s disastrous open doors migration policy". UKIP MEP Patrick O’Flynn is a former Daily Express political columnist, and proprietor Richard Desmond has donated money to the party.